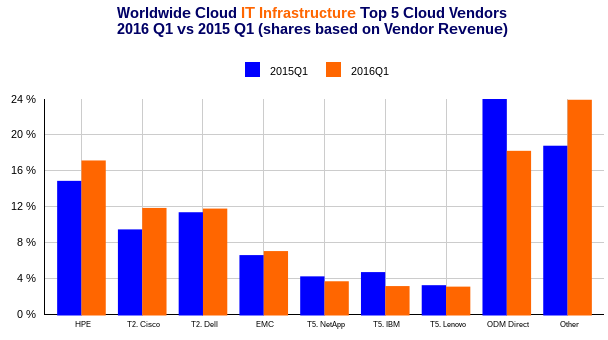 Leading vendor revenue from sales of infrastructure products for cloud computing applications -- including public and private cloud -- grew by 3.9 percent year-over-year to $6.6 billion in the first quarter of 2016 (1Q16), according to the latest worldwide market study by International Data Corporation (IDC). The ongoing transition to Hybrid IT infrastructure models continue to negatively impact some vendors. Meanwhile, total cloud computing infrastructure revenues climbed to a 32.3 percent share of overall IT revenues during 1Q16 -- that's up from 30.2 percent a year ago. Revenue from infrastructure sales to private cloud grew by 6.8 percent to $2.8 billion, and to public cloud by 1.9 percent to $3.9 billion on slowed demand from the hyperscale public cloud sector. In comparison, revenue in the traditional (non-cloud) IT infrastructure segment decreased by 6.0 percent year over year in the first quarter, with declines in both storage and servers, and growth in Ethernet switch. Ethernet switch also showed strong year-on-year growth in both private and public cloud, 53.7 percent and 69.4 percent, respectively. Storage grew 11.5 percent year over year in private cloud, but declined 29.6 percent in public cloud. 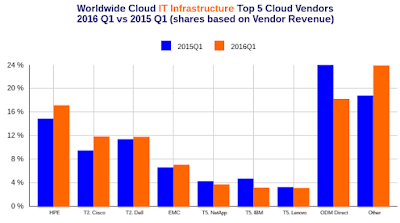 Conversely, server declined 1.1 percent in private cloud and grew 8.7 percent in public cloud. "A slowdown in hyperscale public cloud infrastructure deployment demand negatively impacted growth in both public cloud and cloud IT overall," said Kuba Stolarski, research director at IDC. Private cloud deployment growth also slowed, as 2016 began with difficult comparisons to 1Q15, when server and storage refresh drove a high level of spend and high growth. As the system refresh has mostly ended, IDC believes that this will continue to push private cloud and, more generally, enterprise IT growth downwards in the near term. Hyperscale demand should return to higher deployment levels later this year, bolstered by service providers who have announced new data center builds expected to go online this year. As the market continues to work through this short term adjustment period, end-customer decisions about where and how to deploy IT resources may be impacted. If new data sovereignty concerns arise, cloud service providers will experience added pressure to increase local data center presence, or face potential loss of certain customers' workloads. From a regional perspective, vendor revenue from cloud IT infrastructure sales grew fastest in the Middle East and Africa (MEA) at 25.9 percent year over year in 1Q16, followed by Western Europe at 20.6 percent, Asia/Pacific (excluding Japan) at 18.5 percent, Japan at 17.7 percent, and Canada at 9.5 percent. Latin America declined 21.2 percent year over year, while the United States declined 4.1 percent and Central & Eastern Europe fell just 0.1 percent.